What is a Cigar Pen or Cigar Pencil? 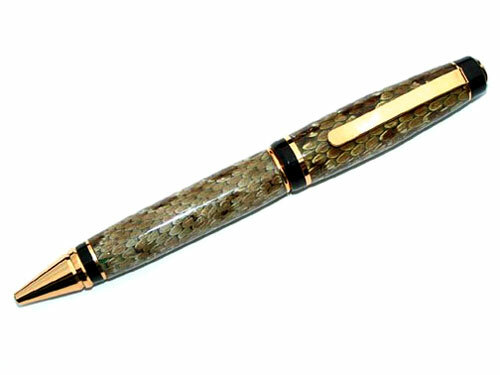 The Cigar Pen is perfect for those who prefer a hefty, more masculine looking pen, but not do want to pay for the more expensive styles of pen. At only $49, these are a great bargain. Prominent black accent bands compliment plated areas while the "nut" shaped insignia found on the end of the cap adds a rugged flavor. 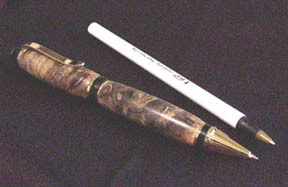 Both the Cigar Pen and Pencil feature twist operation and are available with either a plain or Artisan "A" clip. Pens are supplied with a Parker® style refill with premium Swiss-made carbide writing tip for smooth consistent writing while the pencil features a premium 0.7mm Schmidt® cartridge type transmission for dependable, trouble free operation.